 Rediscovering Dolcetto Let's turn to a hearty Dolcetto today as we devote this month's Wine Focus to the fine red wines of Piemonte. 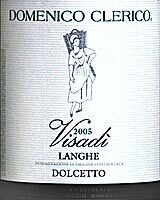  Domenico Clerico 2005 "Visadi" Langhe Dolcetto ($15.99) A Dolcetto in a fruit-forward style, but dusty minerality and smooth tannins keep it on the pleasantly rustic side. Let's turn to a hearty Dolcetto today as we devote this month's Wine Focus to the fine red wines of Piemonte, the Alpine foothills in Italy's northwestern corner around Torino. In one of the many enduring myths of wine appreciation, Dolcetto is often described as a light, fruity wine, akin to an Italian Beaujolais. Perhaps this confusion arises from its name, which might be loosely translated as "Little sweetie." In fact, that moniker apparently relates to the taste of the ripe, black Dolcetto grapes at harvest, but not to the wine it makes, which isn't particularly light and certainly isn't sweet. You'll most often find the name of the grape Dolcetto linked on the label with the name of one of the Piemontese villages where it's grown: Dolcetto d'Alba, Dolcetto d'Asti, Dolcetto d'Acqui or Dolcetto Dogliani. While Barbera is usually sharply acidic, Dolcetto is relatively lower in acid but perceptibly tannic, an earthy flavor profile that shows best in company with food. And in its one aspect that does bear some comparison with Beaujolais, Dolcetto - in spite of its tannins - is best drunk up within a few years of harvest, before the fruit fades and leaves the astringent tannins alone. Today's featured wine, Domenico Clerico 2005 "Visadi" Langhe Dolcetto, is an export by Marc de Grazia, who's generally reliable in his selections of Italian wines ... provided you calibrate to his palate, which tends to favor big, fruit-forward and oaky selections in the "points-chasing" style. Not surprisingly, the Domenico Clerico is big and fruity, still showing a blast of blueberries in the aroma along with an earthy, "dusty" minerality that says Dolcetto. The wine manages to be both fruit-forward and rustic, a bit on the rough side for sipping cocktail-style as a glass of red wine but fine with food on the table. Dolcetto's no ager, and with two newer vintages already in the retail pipeline, I wouldn't count on much more life out of this 2005. But it's fine now, and easily demolishes the notion of Dolcetto as a light and lively little sipper. My tasting notes are below. FOOD MATCH: Pork or poultry or red meat; it was excellent with a pan-seared, oven-roasted butterflied free-range chicken. VALUE: The prices of Dolcetto have been rising in recent years, but the mid-teens is an entirely appropriate neighborhood for this one. Here's exporter Marc de Grazia's fact sheet on Domenico Clerico, from which you may also click to tasting reports on the 2006 and 2007 Dolcetto.